I know people call me a busybody. Maybe I deserve that, but I don’t go looking for gossip and stories about other people. Somehow they just find me, probably because I know so many people and they all seem to talk to me. I’m lucky that I can put most of my energy into serving on the board at the Pennsylvania Antiquarian Society, and cataloguing the Terwilliger family papers that my father and grandfather donated to them. That’s plenty to keep me busy. That’s how I met Nell Pratt, who was working at the Society, and kind of nudged her into taking over as president of the place. She does a pretty good job (with my help), except that she keeps finding bodies. I never heard of such a thing before, but every time I turn around she seems to be in the middle of another homicide investigation. Clearly working at a museum isn’t dull, at least not when Nell is around. This time around it really isn’t her fault: she was asked by a Big Name Developer to check out the history of a piece of land he’d bought way outside of Philadelphia (with the promise of a nice donation to the Society, so how could she say no? ), so he wouldn’t have any problems with the local historians. And then the two of them go and find a body, floating face down in a pond on the property. At least now she has James Morrison, or Cousin Jimmy (he hates it when I call him Jimmy, but he really is a cousin) to work with her. He’s an FBI agent and a good one, and since Big Developer wants only the best, he called in the FBI. So there go Jimmy and Nell, investigating together again. The funny thing is, Nell solves more of their shared cases than he does. But they do work well together, and these days they’re doing a little more than just working, especially after hours, if you know what I mean. I think it’s great. Or maybe I’m just getting mushy, because now I’m seeing someone too, but it’s too early to talk about it. I bet Nell’s glad to have me out of her hair a bit more often. Gotta love Philadelphia history—you never know what you’re going to find. Love the notepads! Looking forward to following Nell! I'm so glad she has help on this one! I could use a cozy book. Right now!! I enjoy the series. I used to have family in the Bryn Mawr area. Thanks for letting me know about as mother great sounding series. My reading list is really growing. I love Marty - she adds a bit of comedic interlude in the books. I enjoy learning a bit of history as I read this series. Being a native Pennsylvanian, I love this series! I can't wait to get my hands on this one! I LOVE Sheila Connolly books! Would love to win one!! Another book on the TBR - when I read a review or synopsis I want to start each book right away. And sticky notes -- aaahhhh - can't resist. If it has words or involves paper or pens, I have to have it ;-). A long time dear friend and I always "pick up 2" when we see anything fun or unique (or I must admit even a pen that says something exciting like LEGOLAND). And sometime we think the sticky notes are so special we ration ourselves so we don't run out. Goofy but fun. I started this series but I need to do some catching up, I really found it interesting. Sounds like an awesome book, and those are the most adorable sticky notes. Well, it certainly isn't her fault if people want to talk and she's willing to listen! Love the stickies - and all PA history! Love the sticky notes!! Story sounds very intriguing!! Has to be the best name for a book ever! I'm ready for some silly stickies---they would cheer up my bad day. I need a new book to read for the summer. I just finished a book. Silly stickies are the best for sharing joy, and other tidbits. What a great contest. 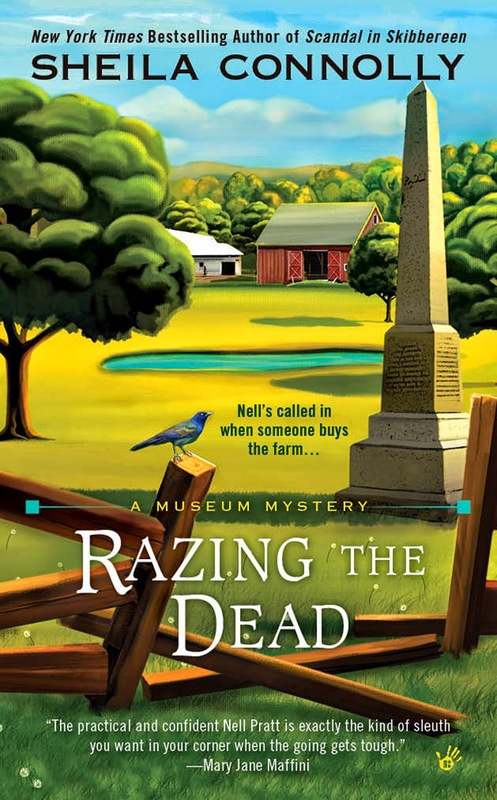 Would love to win Razing the Dead. I love history-who says research is boring! Although, I don't need to find any bodies. I love history, and the relationship between everyone that works at the Society. I love your apple and Ireland series. Love this series! Always wanted to work in a museum ( a library was as close a I got). I've enjoyed the Orchard mysteries much more than I initially I would. A salute to your great writing! The mystery has me wondering who-dun-it? With a little romancing thrown in! The note pads look cool also, I'm keeping my fingers crossed! And thank-you for the giveaway! They are always fun! As always I would love to win. Looks very interesting. Another great author with another new offering for my TBR list. Great series... I've always wanted to work in a museum too. Thanks for the giveaway! Thank you all for participating--and the contest goes on! I can't get enough of Nell, James and Marty....love these books!!! I love Nell, James and Marty...best series ever!! Best series ever....love Nell, James and Marty!! !